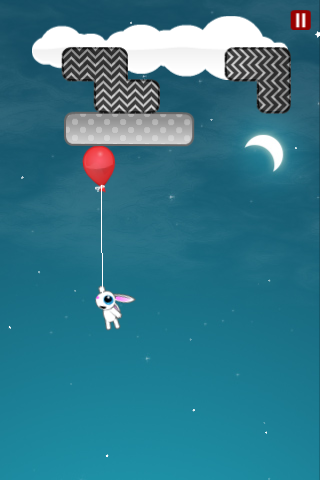 Fly Away Rabbit is a relaxing and fun physics puzzler. You have been called upon to help a bunny fulfill his dream of flying to the stars using a helium balloon (don’t ask him how he plans on getting back down). There are various blocks blocking the way and it is your job to help remove these obstacles and help the bunny realize his dream. The different types of blocks have different ways of reacting when they are removed and can affect the balloon from landing peacefully on the cloud. You must guide the balloon to the cloud where it has to rest for a small period of time before you successfully pass a level. This is fairly easy for the first third of the game and then becomes more challenging. Must say this is an awesome iPhone game tho!